Based on the life of Kim Su-Ro, a man who unified 12 small countries to create the state of Geumgwan Gaya in southeastern Korea during the Three Kingdoms Period in Korea. 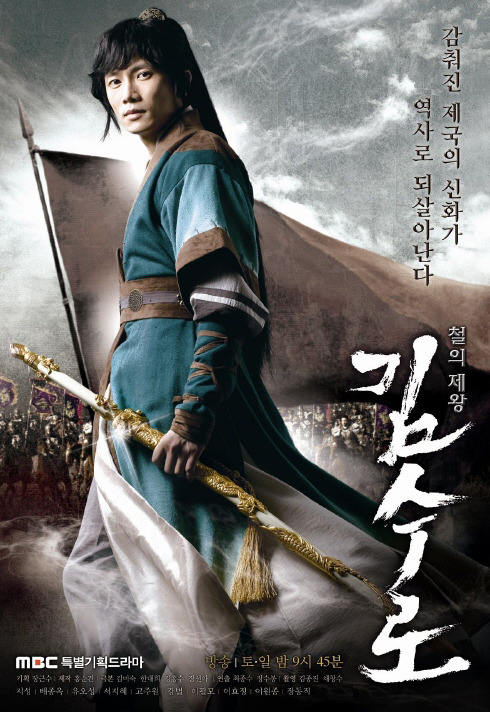 "Kim Su-Ro, The Iron King" will take over the Sat & Sun 21:45 previously occupied by MBC drama "A Man Called God". 천추개 = Sacred dog ??? If this word refers to India as Samguk Yusa says, why did they chose Tibetan monk clothes and headgear for Hwang Ok's brother? AJ Nov 21 2018 1:00 pm I am here not to talk about the acting and the plot. I love history and historical drama, especially Sageuk. I have watched this drama in 2012 on illegal DVDs with limited corrupt subtitles and did not get correct details of the events. Since a proper subtitle is now available, I watched this again to get better information on the story and historical setting of the drama. I am now at Episode 31 (11:13) and heard the word Hwang Ok used for India is Changcheugi Saneun [???]. Can anybody tell me what the exact word is? Pryate Aug 09 2017 5:37 pm Most of the comments below are right. Compared to JUMONG or KINGDOM OF THE WINDS (almost the same period in history), this one is really boring and crappy. Except Deuk-Sun (Jang Dong-Jik), the characters lack charisma and soul. And yeah, I just hate Jung Kyeong-Bi (Bae Chong-Ok) and I wanted to cut her neck and smach her b**tch face throughout the story, from episode 1. There are to many scenes with no purpose, just blah blah, like writers needed to fill the blanks. Those 32 episodes seem much longer than the 81 ones of JUMONG or the 36 of KINGDOM OF THE WINDS that I watched 3 times. Lee Seo Hwa Apr 19 2017 8:21 am It's a drama when Jumong already passed away ! I've seen wikepedia of Gaya Confederacy to check about this drama is heading to! Shay Dec 13 2015 3:20 pm I loved this drama! Of course there were a few frustrating moments but it was at the fault of the writers, not the actors. The second lead actress was glowing. Loved her for the get-go. And Ji Sung... Always an amazing job! -> Actors overact all the time and just make stupid decisions; -> Shin Kwi-gan is a caricature of a villain, sounds weak a good part od the story; -> Yeom Sa-Chi is simply annoying. I hate his guts so much; -> The Saa-ro Kingdom is a joke. The king cries like a baby all the time, his minister are just there for scenario as they have no soul or attitude. There is this one funeral scene when the royal family should be very emotional but instead they look bland and cold about the situation; -> Jung Kyeong-Bi is annoying. Her character is unlikable. Same with her son. He has no soul. There's this one episode where he accepts Soo Ro as his brother after minutes of conversation like their story never happened and he was brainwashed about all their past; -> Apart from a few characters, there is simply no character development ever. They just make weird, nonsensical and stupid decisions. -> Kim Soo Ro is a decent and likable character but he changes too much from a reckless little thief to a proud and honorable hero that it makes no sense; -> Deuk-Sun was one of the most interesting characters with a very cool amnesia story that could have developed better. In a matter of a few minutes in a single episode, he chooses to forget everything about the past and move on. And with that, the writer buried deep the best premise the whole story had. -> Heo Hwang-Ok is one of the few likable characters and the only one that seems to make good and smart decisions. She's also very beautiful and makes an appearance. Sharon Sep 06 2015 4:05 am I love how this drama focuses on the real structure and making of a true king/ruler and one who wants power. Soo Ro doesn't want to become king nor have power but wants the goodness for the people... majority of a nation is peasants and farmers... so great. While the power struggle is between two who desire power and the throne, do not care for the people... only scorn and look down. Aya Aug 12 2015 5:44 am I'm sorry to burst your bubble, but Heo Hwang Ok is not necessarily Indian. It's more likely that she's from Thailand. Fan Feb 01 2015 8:00 am Since Heo Hwang-Ok is an indian princess, how dare a Korean portray her. She looks nothing like an Indian and therefore has no physical right to portray an Indian princess. I don't care for her talent. This just seems so racist. Why can't the director bother to put a authentic or at least someone who looks Indian, into the role instead? How rude! This is an insult to my country. Other than the preposterous role, this drama is pretty good. Minor mistakes can ruin a good picture. Keep note of that. This actress can't even pass as a northern Indian (more likely to have light skin). Honestly. shar Dec 01 2014 2:34 pm Good drama but there was room for improvement. Soo ru was too quick to accept lady kyeongbi when he found out who she was. He should have been a bit more angry and unaccepting because of what she has done to him. Also some bad actors here and there. fayaz Jun 15 2014 6:25 am great drama but i love the Kim SooRo's theme song but i don't understand the meaning of the song can anyone show me were to find the English subtitles of that song thanks. Sonya Jun 15 2014 5:04 am Shin Kwi Gan's casting is weak - quite artificial and caricature looking - stupid looking. Episode on indian princess during the attack of her caravan - very unrealistic since she appeared too composed and "in love" while the father and entire caravan were dying. she could at least have shown some fear and concern for hers as well as her group's lives. Overall, a great drama that meets the basic expectations of its viewers. The plot was very well thought out. There were no usual antics and irritating mediocre, overacting comedies in between scenes. RiAh Jun 04 2014 9:48 am well I didn't finish watching this drama. does suro fall in love with hwang ok? rav4 toyota phoenix az Apr 01 2014 4:55 am Having read this I thought it was very enlightening. I appreciate you finding the time and energy to put this informative article together. I once again find myself spending a lot of time both reading and posting comments. But so what, it was still worthwhile! bookin2min.skyrock.com Feb 02 2014 8:10 pm Hello! I could have sworn I've been to this website before but after reading through some of the post I realized it's new to me. Forex Jan 30 2014 9:21 am There is, however, a big downside to partial close is that there is no balance between risk and reward. It is also very important for you to fill in your contact address along with your e-mail ID and phone number. You can also use ACH transfers, but these take about 4 days to process. forex Jan 30 2014 9:13 am Now 4% is a great daily return, but that is best case scenario. So you install Meta - Trader4 (free), and copy the Forex Auto Pilot file to the experts folder in Meta - Trader4 (MT4), click a few buttons and you are up and running. As in when the market rates start to dip it halts trading for a bit until it picks up and put you in control of your trading. Forex Jan 30 2014 7:24 am Check with the CBOE or ISE World Currency Options for a list of all the symbols, or ask your broker. 98 trillion break-down is as follows- (1) $ 475 billion in outright forwards (2) $ 1. Online currency trading is done through Forex trading or Foreign Exchange Trading. monitor Jan 30 2014 7:11 am One of the biggest government spenders on credit cards was an employee of a federal transport agency in Australia. Article Source: sarasota luxury homes, florida new home condo for sale. A short sale is when homeowners are, in a sense, forced to sell their homes to avoid foreclosure. Kristopher Jan 30 2014 2:16 am By putting the free offer at the end of the meal, you reduce the chance of making a smaller entree sale. Do not hold back, respectfully ask the waiter with what the meal is prepared. Postcards are effective advertising material, a proven material that can produce leads to your products. okeyode Akintola Abimbola Dec 27 2013 3:57 am Wahoo.u can understanting until you watch it.it is an instresting story. Cos ia friend of my recommend it for me. I don't belived him until I watch it!!! I swear u will not blame ur self. JC Jul 17 2013 1:22 am Although this series cannot top my all time favorite historical drama Queen Seon Deok (doubt anything can), this series is definitely way up there in this genre. Very interesting story line and the love conflict was so good to watch. Highly recommended! Godspower Ryan Jan 12 2013 4:08 pm This is one of my best movies in the world.As a tragi-comedy,which comprises adventure,romance is concised & classical.I'm in love with this movie! araromi enoch Dec 27 2012 6:08 am kim so-ro i just like no2 what you act at the movie was so facinating no3,out of all the movie of korean that i have been watching this is the best one so keep it up. Damilola Nov 24 2012 2:47 pm Pls can sum1 tell me did ahyo later die nd wat later happen 2 hwang ok,i jus started watchin dis drama in dvd's. Austin Amechi Sep 22 2012 4:35 pm Wow this movie(the iron king) is so interesting, i use to watch this movie every blessed day cause of the concept, i love SOORO'S roll, even Hwang-Ok to, Hwang-Ok your Beautiful indeed, to be honest with you(Hwang-Ok) i watched and watched this movie cause of you....i will like to know you more(Hwang-Ok), please forgive my rudness........and where did Cheongeon went to, cause i remember when that priestess told Cheongeon wife that he was alive. patty Mar 07 2012 5:17 am Hmmmmm I'm still watching it @moment.........but I like so far. maej Sep 19 2011 1:20 am super super super like...Ji Sung was so charming in this drama and I just love his smile. It's all good, the characters, the acting, the production - one of the best! margot Jul 16 2011 6:29 am The Korean dramas are really like a drug that I'll never get rid of. Starting with Dae Younggeum till this Kim SURO, the historical Korean dramas became my daily drug. Beautiful actors, good acting, nice music, very good scripts, I slowly started to get under the magic of the Korean dramas, and also to be interested in Korea's history and Korean habits and culture only due to these films, the best ambassadors of their country. Keep the best work and Komapso ! Bea Jul 13 2011 11:09 am Beautiful this drama, the music, actors are amazing,interesting, with wonderful interpretation. I ador this drama Komapso! marilyn Feb 25 2011 6:14 am i'm a fan of ji-sung and how i love to watch this drama. i with there will be an english subtitle of this project. i also want to see ji sung and eugene together. Lisa Feb 17 2011 4:17 pm I love this drama! I don’t speak a word of Korean and I’m a black girl living in the South. But, I’m hooked. It’s better than American television. I find myself watching the episodes over and over. I can’t wait for the next airing!! Keep it up Korean television producers and directors! I love you!!!! Herb Kamada Feb 14 2011 6:53 pm hurry and put the schedules out in english. I just got hooked on Kim Suro the iron king and still guessing when the program comes on. Herb Kamada Feb 14 2011 6:47 pm I got hooked on the Korean dramas'and not getting enough sleep. Even though seen in the evening, I watch the replay from 1:20 or 2:20 in the morning. Please put the schedules in english and on the final episode so i don't have to guess. I don't watch the news or programs on the cbs,abc or nbc network. I learn more of whats going on in this world and way before the american media ever covers. They think murders, car jacking, shooting etc. are important news. phooey. beverly jenkins Jan 31 2011 1:00 am This drama is beautiful! I been watching it for two months now. I had to time the clock and got up set if I thought I missed it. I hope this collection come out on Dvd with the translation. The acting and the clothing is amazing! Virginia Haglund Jan 25 2011 7:39 am I love to watch korean drama serie and movie,specially historical setting im from Philippines and now residing in Sweden,I dont speak in Korean im depending on english subtitle,its a pity that some of the episodes has no translation and some episode are broken,I used to watch online thru website my soju.com.Thanks i still love to watch korean film,they have a good quality when regards to story..keep up the good work..good luck! Ethezil Jul 18 2010 12:29 pm I love this drama. I want the episodes 14 and 15 to be translate as soon as possible. I am from Puerto Rico and the people over there love it.We watched on the PC. We watched them does not matter where they come from , when they are good drama , we love them from Japan, Korea, and etc..... It is nice that through the dramas we learned about the culture and we appreciated the beautiful places and nature. It is amazing! I love the mountains, the rivers, the homes, keep the good work!